After some careful consideration, I wanted to showcase my knowledge and opinions through another new series I devised, Meticulous Mouthfuls. Sort of a cliche’ Gourmand’s palate pusher if you will. This time around, you’ll get a fully illustrated perspective on how I really feel about certain places. No character limits, censorship and detail left unnoticed. The critique I’ll be bringing is a teaser for things to come, so I hope you all will look forward to it. Piedmont is a place where Cal-Grads settle down and build their nests as I’d like to put it. The area should be no surprise to a lot of Bay Area foodies (especially in the East Bay), surrounded by some of the hallmark culinary corners worth checking out. Cybelle’s Pizza, who also had a branch in the historical area of Uptown Oakland, maintain tradition by bringing an eclectic array of Pizza pie flavors and textures since 1981. Fenton’s which is on the far end of Piedmont is a must for many who come through the area. Serving as a pop culture reference in the popular Pixar movie UP, the ice cream parlor makes an appearance in the most heartwarming way possible. Last but not least, Piedmont further elevates in culinary class when considering Commis (the One Star Michelin Spot) of the East Bay, painting a palate of flavors for the Bourgeoisie of the hillside. Pictureception? A teaser for things to come? 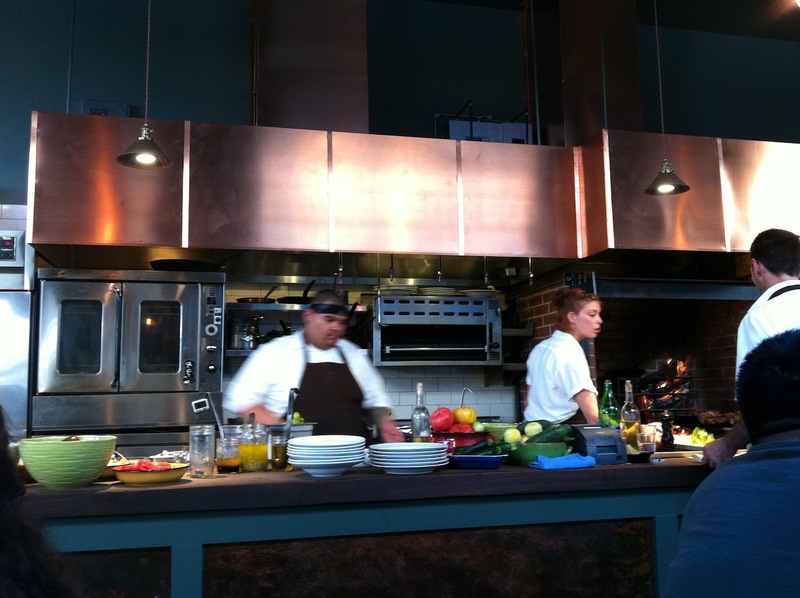 Interior Shot #2: Near center view of action in the open kitchen. Alice Waters (Owner of Chez Pannise in Berkeley) constantly pushes her organic agenda with refined interpretations of sustainable and farm-to-table type of experiences. Naturally my skepticism was off the charts to check out Homestead considering the stroke of bad luck last time I had to try another poop hole joint. 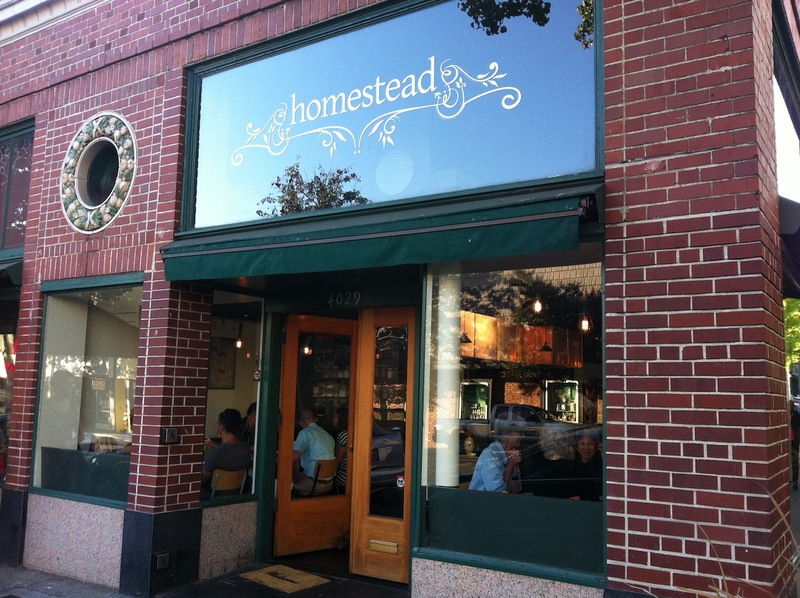 Homestead sits comfortably on Piedmont Ave. with decent signage and foot traffic, the only nuisance being a 5pm-post commuter/residential traffic and accessibility. A place like Piedmont doesn’t really enjoy accommodating to outsiders of the bubble. I can attest to that especially having well over a hundred visits to the small junction town within the past ten years. Nothing improved to remedy the early dinner commuter situation and the locals are sitting pretty in their coffee shops or walking with ease whenever something pops up in the neighborhood. As my girlfriend and I arrived, we made it a point to set reservations early; thankfully, we were successful despite the place being open a mere six weeks. The hostess seated us central to the entire dining area and my vantage point was infringed given the rest of the dining hall was behind me. Turning around constantly was a hassle and I refused to let that one inconvenience ruin an entire experience. The ambiance was live and festive, central brick oven with a crimson fire burning constantly. Foot traffic moving from the service area, dining tables and dishwashing was flawless; Similar to a squad of ants going to and fro between the colony and searching for shards of green leaves. The wine we started with was suitable for the entire experience. 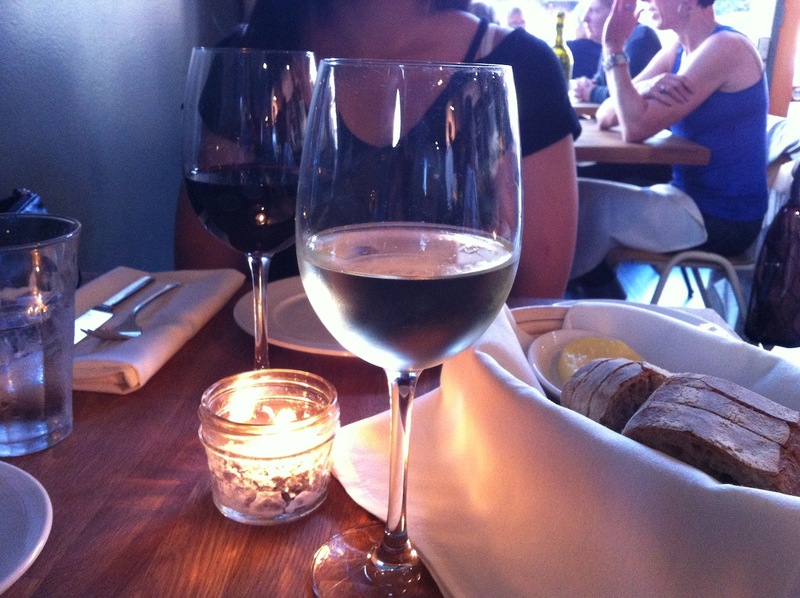 The lady’s Syrah was mildly spicy with plenty of berry notes bursting after every sip. Given that we chose the Ribeye, it would bring body to the pairing as we discovered much later how delicate the texture of the Ribeye itself has. 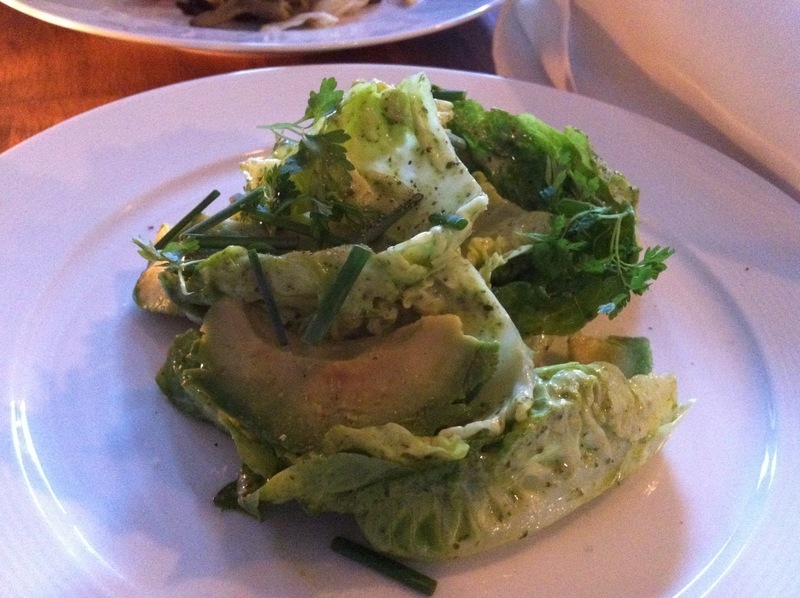 Our appetizer salad was straight forward and well balanced. Everything was harmoniously sharing the stage and orchestrated flavor progression from beginning to end. The hints of coriander were maintaining a steady rhythm in the dressing. The pepper wasn’t too aggressive and added the necessary pinch to the buttery slices of avocado. 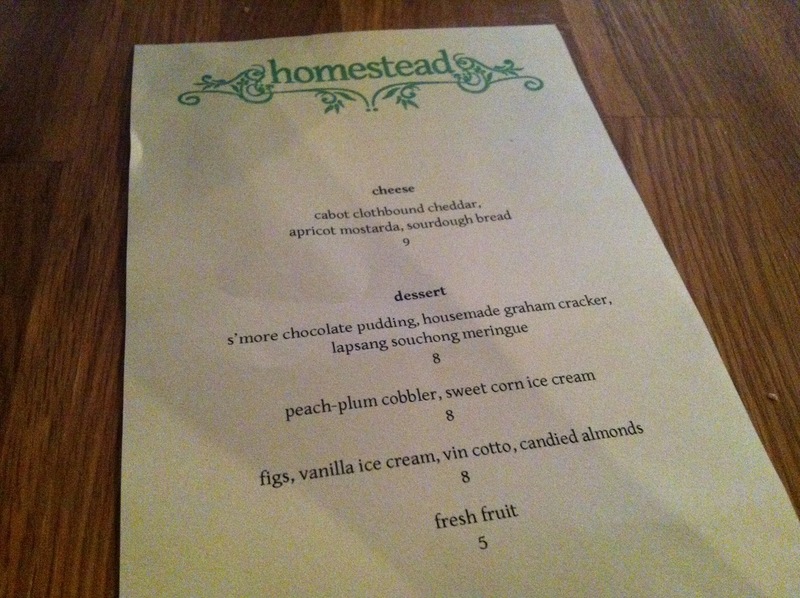 I’ve never been one to really appreciate salad as an elevated dish (had some horrible experiences in the past); however, Homestead’s culinary squad proved me wrong, giving a great start to our meal. The Chantrelles plate added a bit of enchantment on our table as it was placed in front of us. As usual the technicians at the stove did not leave any room for error, serving a well composed and balanced presentation of flavors and textures. 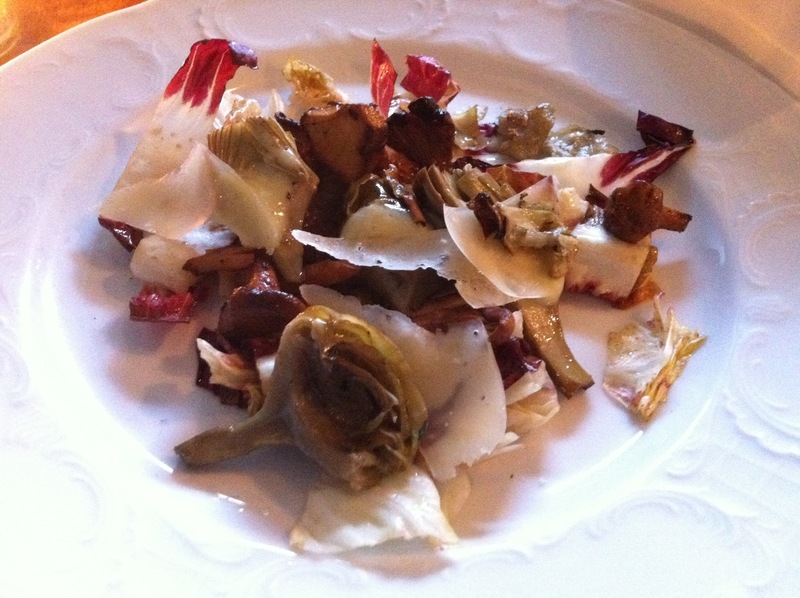 Smoke and earthiness dominated the theme of the plate, with the Grana Padano adding some nuttiness and body to tie the artichokes and mushrooms together in matrimony. The treviso was tamed and there were no signs of a bitter ambush waiting to happen. Two for two, I’m awaiting for the next home run and suddenly the pace slowed down out of nowhere. For whatever the reason, maybe it was a fumble with the third set of plates (given there were multiple entrees being sent out all at once). I couldn’t help but wonder if the reason for the wait was simply because of our preference of medium-well steak as opposed to medium rare (the preferred). Fifteen minutes have elapsed and the photo shoot (which was occurring throughout our meal) continued on capturing whatever movements it can of the inhabitants of the place. 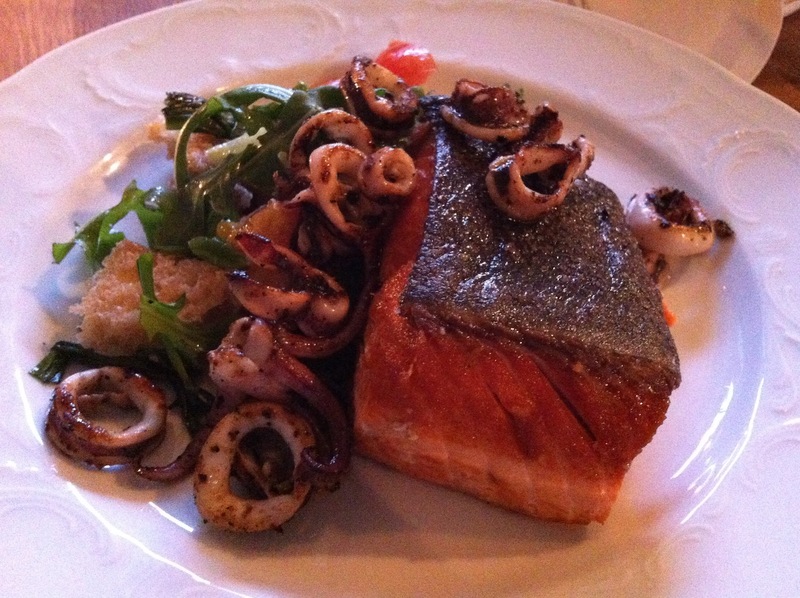 Finally the Salmon dish joins the table along with the Ribeye, let’s take a look at the Salmon first. The crispy skin was cooked to perfection, no leftover scales and nothing but a crispy bliss. The tomato and cucumber panzanella added the much needed layer of acidity for the salmon, bringing out sour and tangy notes to extinguish the smoky nuance of the spicy squid. Squid was also tender, not rubbery which makes it easier to eat and enjoy. The arugula was nice, adding some color as a backdrop to the duo of seafood proteins. As a side note, our waitress Olana hinted at Liz (one of the chef and owners of Homestead) serving as a major advocate for Salmon Skin and finds it wasteful whenever it is removed on any Salmon dish. I can respect her views on this because I too have a recipe I developed, using crispy Salmon Skin as one of the components for an appetizer dish I’ve served in the past cooking dinner for friends. 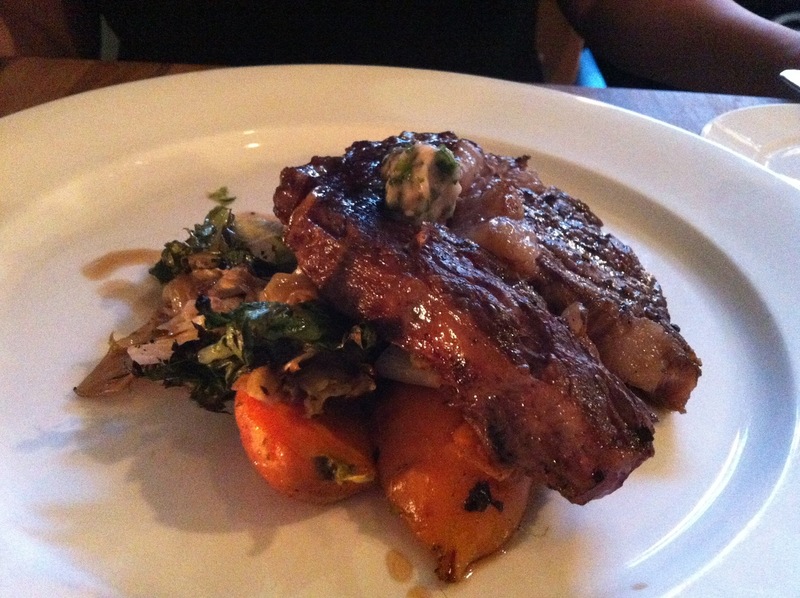 Now we can finally get into the final entree of this meal, the ribeye. Initially, I was quite skeptical with the outcome of this dish seeing as I went against the grain and cooked the protein a little bit more than I preferred. To be frank, I can do without the without the escarole, I felt the charred remains served more like a bushfire easily forgotten and doused with bone marrow oil. Are you serious? 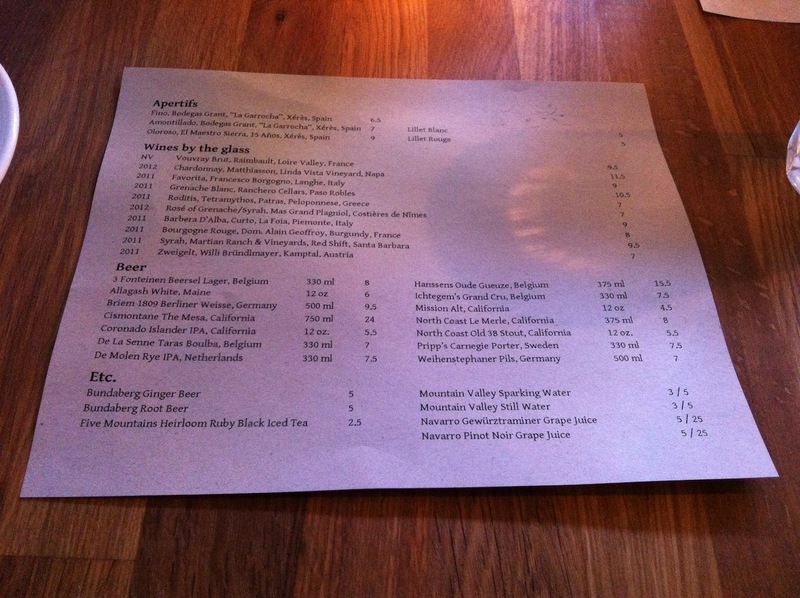 I was down with the whole menu until I read ‘Lapsang Souchong Meringue,’ am I really diving deep into the rabbit hole? For the past thirty minutes, I noticed this dish leaving the left side of the kitchen station like hot cakes. After some deliberation I figured, “Why not?” Placing our order we waited for a mere five minutes and just in the nick of time it falls in between us. Trying the components separately granted me clairvoyance of the bigger picture. 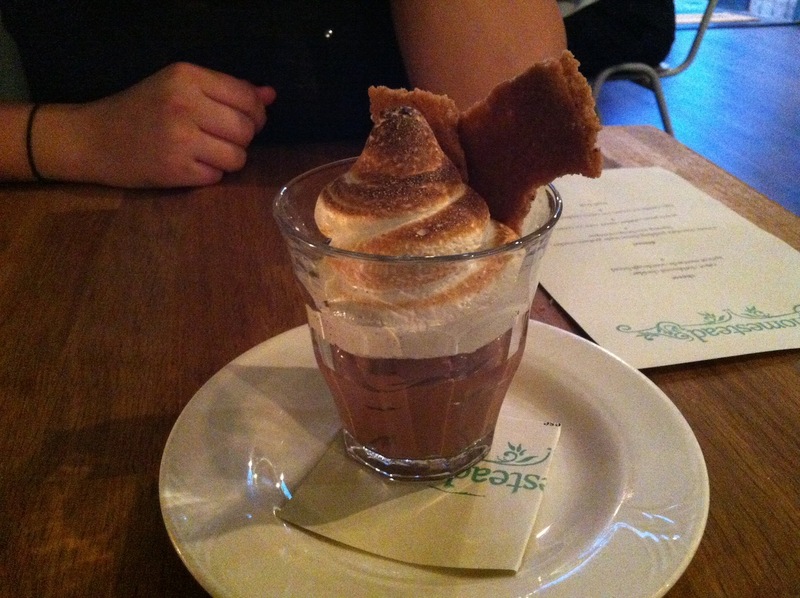 The Lapsang herbs added a depth of smokiness to the dessert, the graham cracker had a nice bite to it and just enough cinnamon not to dissuade you from eating the rest of it. The pudding wasn’t too sweet. My only qualms with this treat was that it lacked marshmallows but that’s my id talking. The S’mores that didn’t need a campfire. Overall, we spent a pretty penny at this place, for a place being open a few weeks they have the right idea. Usually fine dining comes at a price where smoke and mirrors on culinary classics, touch of whimsy and the cliche’ Avant-garde presentation will net you a Michelin Star (or three) with a hoard of zealot diners ready to lick your boot on command. 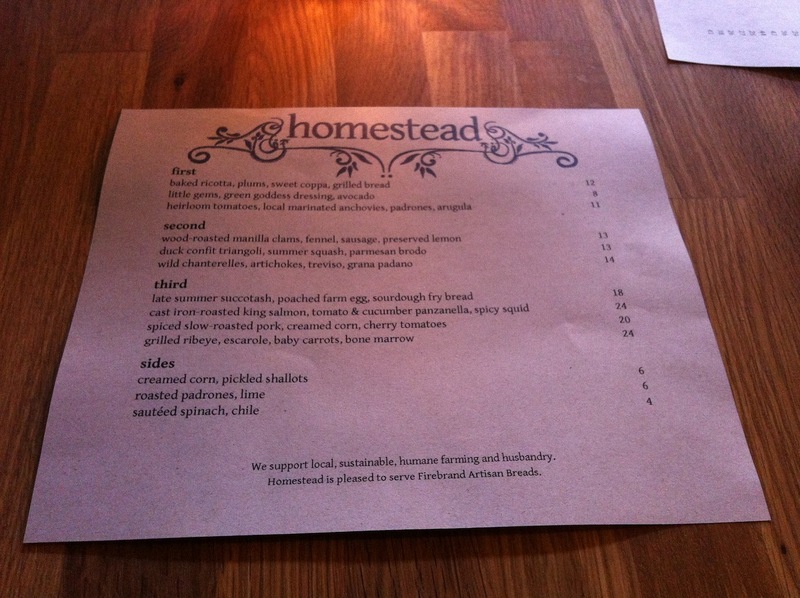 Homestead brings you back down to planet earth: eating food harvested from the source and prepared with primitive (and humble) Americana roots. I am elated with my experience last weekend as a first timer in Homestead was met with great success. 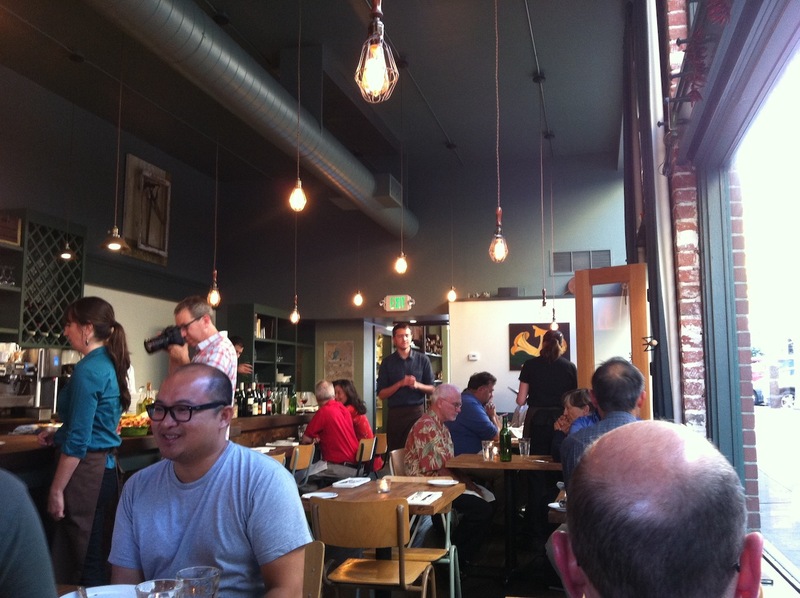 One would be foolish to relegate such a dining locale compared to its more diversified metropolitan kin (San Francisco or Silicon Valley) even though Piedmont remains isolated as a haute culinary destination within the confines of ‘The Town’s’ borders. 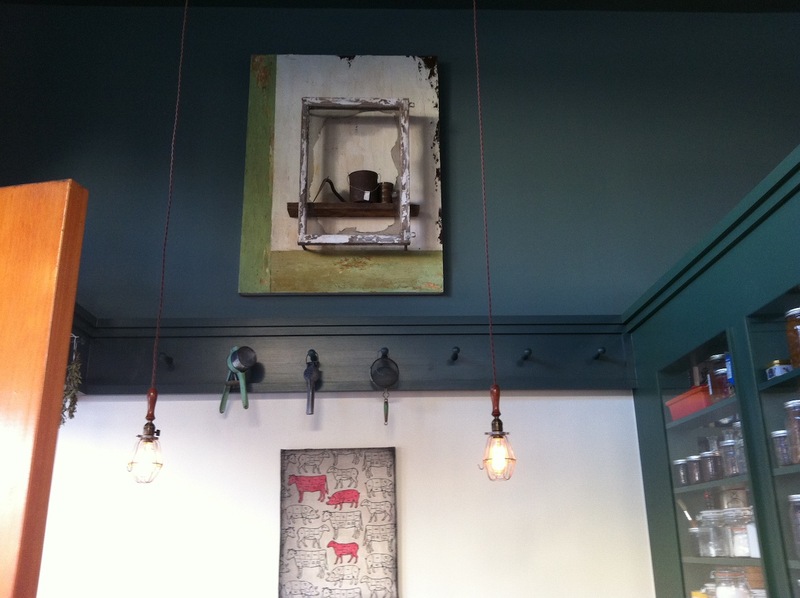 Homestead is now apart of a long standing list of commendable dining options. Giving Oakland (Piedmont) one more reason to shine brighter, greener and to feel more at home.